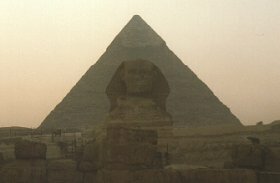 Where can I learn about Egypt's Pyramids? View the Khufu Pyramid on a Google map. - Construction date (Estimated): 2589 B.C..
- Construction time (Estimated): 20 years. - Total weight (Estimated): 6.5 million tons. - A total of over 2,300,000 blocks of limestone and granite were used in its construction with the average block weighing 2.5 tons and none weighing less than 2 tons. The large blocks used in the ceiling of the King's Chamber weigh as much as 9 tons. The estimated total weight of the structure is 6.5 million tons! - The base of the pyramid covers 13 acres, 568,500 square feet and the length of each side was originally 754 feet, but is now 745 feet. The original height was 481 feet tall, but is now only 449 feet. The majority of the outer casing, which was polished limestone, was removed about 600 years ago to help build cities and mosques which created a rough, worn, and step-like appearance..